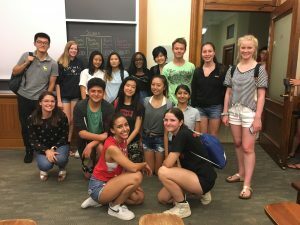 Nirmeen and Wen Zhen go to two different NYC Outward Bound Schools, but this summer they had the same strategy: take advantage of the summer months to challenge themselves and get an early taste of college! And NYC Outward Bound Schools was ready to support them. As part of our To & Through College program, we work with school counselors at all our schools to make sure that students have opportunities to explore college while they’re still in high school. Giving students a taste of college life–including dorm life and dining halls–is a priority at our schools. Most of our students will be the first in their families to attend college, so they don’t have any frame of reference when going through the college application and selection process. But through college visits arranged by our schools, alumni talk-backs with recent graduates, and access to exclusive summer college programs at some of the country’s most respected universities, students like Nirmeen and Wen Zhen are able to make better informed choices, setting them up for success after high school. Nirmeen, a senior at Brooklyn Collaborative, an NYC Outward Bound school in Carroll Gardens, Brooklyn, found a great opportunity through NYC Outward Bound Schools and spent three weeks at Cornell University’s competitive Summer College program, for which she also received a scholarship. What Nirmeen really missed was her Crew, NYC Outward Bound School’s distinctive advisory model. Students at our schools meet 3 – 5 times a week in small groups with a Crew advisor to share their goals and challenges in a safe environment. 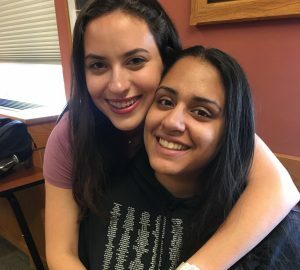 Students routinely describe their Crews, which often stay together throughout high school, as a “second family” that provides critical social‐emotional and academic support. While she was able to take advantage of Cornell’s support network, including one-on-one meetings with professors and tutors, Nirmeen knows that she could have gotten even more out of the program if she had been able to find or create her Crew for those three weeks. Her professors and classmates were friendly and engaging, but building the kind of community she has at Brooklyn Collaborative–where she feels utterly comfortable and supported–was impossible to do in just three weeks. Now, Nirmeen knows that finding her Crew is something she’ll need to do on her own in college. Wen Zhen, a senior at Leaders High School, a NYC Outward Bound School in Bensonhurst, Brooklyn, had a similar experience. Wen Zhen applied and was accepted to Columbia University’s Summer Immersion program, a three-week program for high school students (Wen Zhen also earned a full scholarship). Like Nirmeen, she loved her classes, which focussed on creative arts, and she learned so much about being a college student. Also like Nirmeen, she found the academics to be difficult but not impossible; like all NYC Outward Bound Schools, Leaders focuses on preparing students to succeed at college-level work. What really challenged Wen Zhen was the intimidating environment of an Ivy League institution: she felt out of place on Columbia’s campus and deeply missed the sense of belonging she feels at Leaders. Like Nirmeen, Wen Zhen is certain that if she’d felt a sense of belonging and community, she would have been able to take full advantage of her three weeks at Columbia. Without enough time to build her Crew, she didn’t always dare to push herself beyond her comfort zone. “I feel like when you’re intimidated by the environment that you’re in, you’re not really focusing on ‘hey, let’s connect, let’s learn off of each other, let’s reiterate what the teacher said, let’s go over notes together.’” said Wen Zhen. “I was nervous to speak to other people . . . that kind of hindered me.” Now, Wen Zhen knows the value of Crew and how forming those relationships enhances her learning. Ultimately, both Nirmeen and Wen Zhen are so glad that they had the opportunity to attend Cornell and Columbia, and would do it again in a heartbeat. It gave them an authentic college experience and a taste of what campus life may look like. They loved their classes and classmates, and appreciated the challenges both programs provided. For both, though, one of their big takeaways is that a sense of belonging goes hand-in-hand with academic success. Luckily, they have another year with their NYC Outward Bound Schools Crews, and they’ll be practicing relationship-building and self-advocacy, skills they’ll need in college. Huge thanks to Columbia University and Cornell University for welcoming our students this year, and for committing to provide incredible opportunities for high school students across the country. We are grateful for their partnership.